It’s a small house. A mere 18 feet at it’s widest, it stretches almost 100 feet deep. 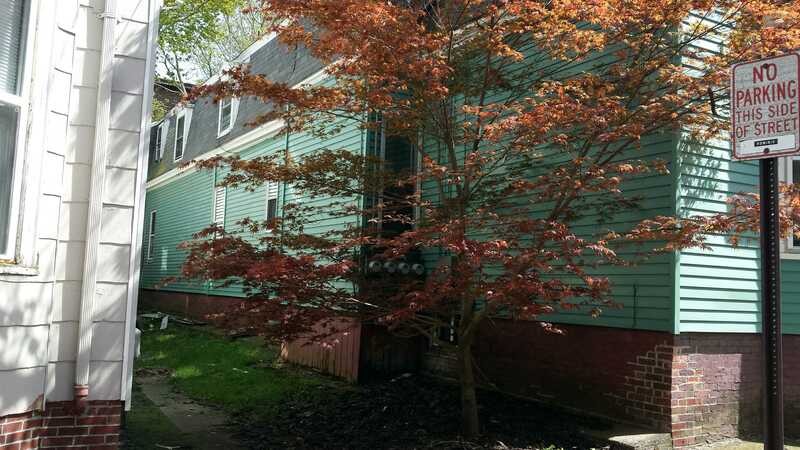 The entire lot is 36 feet wide. 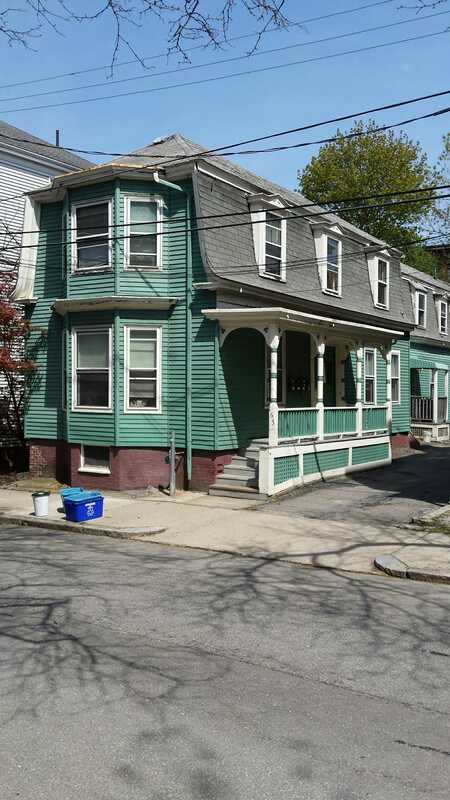 A true urban lot for a working class family much like we saw at 20 South Street. The city gives a build date of 1884. I’m not so sure about that. The official and final platting for the neighborhood was filed in 1884 by Walsh. At that time, Abby Steele was the owner of the lot and it had a house on it. That being said, the house plan as shown on the plat map, a section of which I have included below, is quite different from what is there now. Moreover, Steele’s deed to Edward Proctor dated April 4, 1889 makes reference to the land but speaks of no buildings. 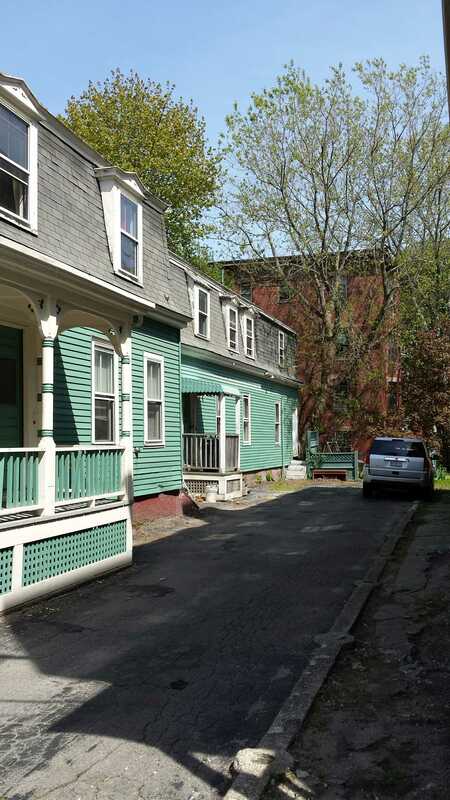 When Proctor sold the property in September of 1890 the ‘buildings thereon’ are mentioned. From this, I am putting the build date of 1889-90. 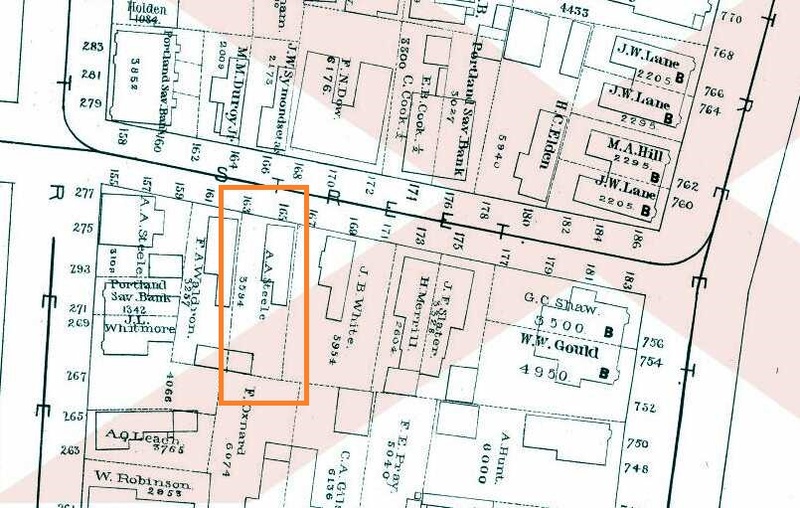 Section of 1884 plat map for the neighborhood. Edward E Proctor was born in Portland in 1852. His maternal grandfather, Samuel March, was a Colonel in the Continental Army during the Revolutionary War. His father, John C, was a local real estate agent along with his brothers. Beckett lists Edward as a ‘clerk’ in 1873. Edward seems to have been taken into the family business in the 1880’s as he starts appearing in the registry of deeds with increasing frequency in the latter part of the decade. The family lived on Danforth Street in the block between Tyng and Tate Streets. Portland Company stock certificate issued to Edward E Proctor in 1902. Maine Historical Society. 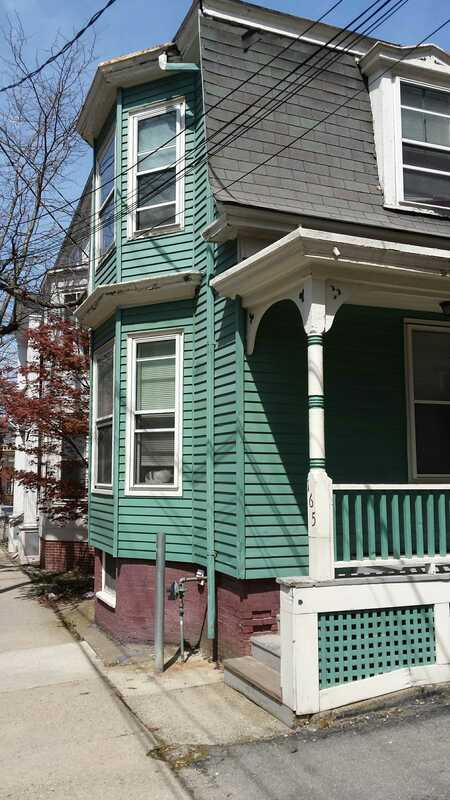 When Arthur Morse purchased 165 Neal Street from Edward Proctor in September of 1890, he took a mortgage on it from Edward’s uncle, John F Proctor, for $450.00. That mortgage was paid in February of 1894 which was the same year Arthur and Sarah sold the property to John Liscomb. According to Beckett, Arthur was a bookkeeper. As for a ‘style’ I selected “Mansard” for the roof even though it’s much too late for the style and nothing else on the house is in keeping with it. There is a touch of italianate in the decoration above the windows but again, nothing else really fits the style. In the end the ‘style’ can be best described as vernacular. It’s not likely that there was any architect involved. Proctor no doubt worked directly with the builder to create a house that met his needs. It should be noted that I don’t think Edward Proctor lived in the house. It is my opiníon that he built 165 Neal Street as income property. 165 Neal Street in 1924. John F Liscomb was the general manager of the Portland Steam Packet company when he purchased the property. He may have purchased the property for his son Arthur who would have been 27 years old at the time. In his will of 1920, John states 165 was the house his grandson’s father lived in. Arthur had died in 1917. John would go on to be involved in the loss of the Steamer Portland in 1898. The loss of the Steamer Portland and all 190+/- souls on board on the night of November 26-27 1889 is still considered the worst maritime disaster in New England history. John Liscomb as general manager was known for demanding his ships sail, and arrive, on time. Some historians have believed this caused the captain of the Portland to sail in adverse conditions. This has always been balanced by the facts of Liscomb attempting to contact the captain via telephone that afternoon to insist they don’t sail. Sadly, that message did not get to the captain in time. When John F Liscomb died in 1920 he passed the property to his grandson, John I Liscomb. He immediately sold it to Louise F Milliken. She was the owner of record for the 1924 assessment. When she died in 1930, the property was sold to the Lightbody family. It would change hands 6 times in the next 20 years and another 3 times in 1951 alone. As there are far too many owners to tell everyone’s story, I will close with one more. Clarence Lightbody was born in Bath Maine in 1884. In 1911 he married Ethel Jones in Bath. Ethel was born in England in 1885. Her family immigrated to Massachusetts around 1890. They would live in, and have children in, Pennsylvania and New York before landing in Bath in time for the 1910 census. Clarence died in 1958 & Ethel in 1977. They are buried in Bridgeport CT. The house is currently listed as having 4 apartments.